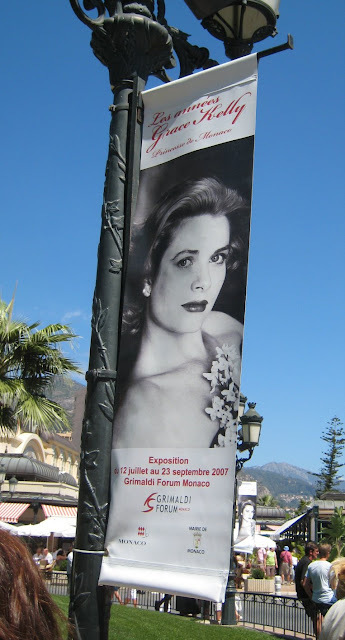 You see these beautiful posters everywhere in the Principality - advertising 'The Grace Kelly Years,' an exhibition at the Grimaldi Forum. I've not visited yet and will do so in September when it will be less crowded, but have heard it's just beautiful and of course very moving. This poster is opposite the casino - you can just see a corner of the Café de Paris on the right of the photo. One of my all time fav moments in film is in the movie rear window. Jimmy stewart is in the wheel chair by the window and he hears a knock at the door. The camera turns and it is grace kelly in a simple elegant white dress framed by the door. she truly looked stunning. The man who has everything?